Image: Alaister Russell/The Sunday Times Mzwanele Manyi talks to members of the media and supporters, 09 January 2018, at the Joburg Theatre in Braamfontein, where he launched African Transformation Movement a new political party. The All Africa Decolonisation Congress has accused Mzwanele Manyi of wanting to use money from the controversial Gupta family to fund the party. The AADC's allegation was made after Manyi on Wednesday joined the African Transformation Movement (ATM). 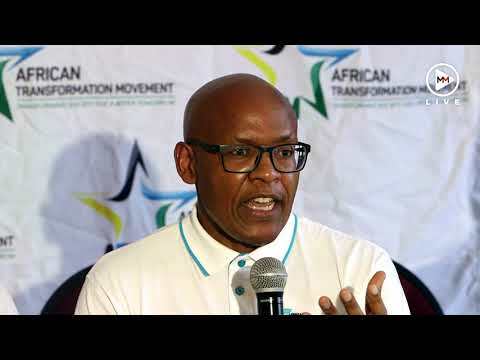 AADC's acting spokesperson Olebogeng Mokomele yesterday said Manyi raised the funds from the Guptas while he was still president of the congress, launched last month. But Manyi last night said the allegations were "nonsense and rubbish" and threatened to sue Mokomele. Mokomele said: "Just before December 19 we had a meeting and Mr Manyi said he knew people overseas [who could fund AADC]. "Mr Manyi did not disclose the identity of those people and he left the country to meet them. When he returned, Mr Manyi informed us that the funders required us to create a bank account through which the funds could be transferred. It's possible he could use money from Guptas to fund ATM." Mokomele said the party's leadership were baffled to later learn that Manyi was planning to join ATM. He said this resulted in AADC expelling Manyi from the party. Manyi said he started the party with his own resources, adding that he would soon deregister AADC.